The earliest motorcycles were little more than reinforced bicycles – difficult to ride but quite durable. By 1920, Condor had introduced a motorcycle with a two-speed gearbox and a “real” front fork – World War I had been a revealing proving ground. The period between the wars saw both commercial and racing successes, but after 1945, Condor was devastated by a lack of raw materials, and more importantly, no reliable source for engines. The Army needed a new design, narrower and easier to handle. The Jeep had taken over many of the motorcycle-and-sidecar’s duties during the war, so the role of the motorcycle was changing. BMW and Zündapp boxer engines were “closely studied” and the resulting side-valve, shaft-driven boxer bikes bore a striking resemblance to BMW’s offerings. The new A 580 was robust and expensive, but it was also heavy and not successful in the civilian market. The Army changed gears again, asking for a lighter, more maneuverable bike, and Condor began development of the A 250 in 1956. The specified 250cc single was to have equal or better power than its predecessor, but be much lighter and easier to handle. With low production numbers anticipated, Condor could not tool up for a bespoke engine, so they turned to Maserati for their 246cc unit. After only 30 A 250s were built, the relationship soured, and Condor found themselves designing a new 249cc engine, based on the A 580’s case, but using a single-cylinder, overhead cam, side-valve configuration with shaft drive. This engine, too, closely resembles a BMW single – the R25 – but no parts are interchangeable. Bevel drive for the cams was toyed with, but eventually a chain-driven system won out. 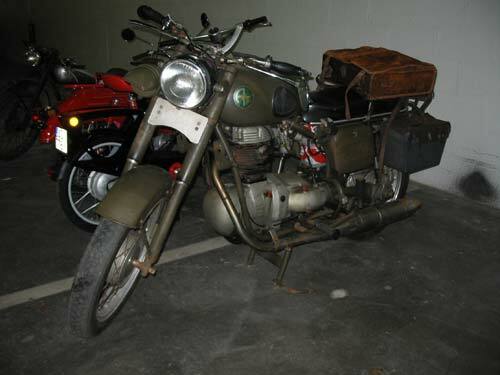 Introduced in 1958 as the A 250 (A for “Army”) at the Geneva Motor Show, the motorcycle was a modest success, and even enjoyed some success in the civilian market with the C 250. The first run of 50 engines suffered from overheating and cam tower failure, but an “evolution” model came out in 1960, solving the problem. 573 Condor A and C 250s were delivered before production ended in 1969. Condor no longer builds motorcycles, but it is still in business, fabricating metal parts for other manufacturers.